Fiat Chrysler Automobiles in Auburn Hills Friday debuted its 2019 Dodge Durango Pursuit for public safety officials. The vehicle has improved brake performance and durability, as well as performance-tuned, load-leveling suspension. New features include a new front fascia with integrated brake-cooling air ducts for improved brake safety performance and durability. It also features a performance-tuned, load-leveling suspension to bolster control and stability. The 5.7-liter HEMI V-8 is the same powertrain combination most commonly deployed in the Dodge Charger Pursuit, the top-selling police sedan in the U.S. market. The Durango Pursuit also offers a two-speed transfer case for low-range, off-road capability and larger, heavy-duty anti-lock brakes that deliver a 60-0 mph stopping distance of 134 feet. All models are equipped with an eight-speed automatic transmission and all-wheel drive. Dodge Durango Pursuit V-8 models include the segment’s most technologically advanced all-wheel drive system. The models earned an EPA-estimated 25 mpg highway with the 3.6-liter Pentastar V-6 and 22 mpg highway with the 5.7-liter HEMI V-8 engine. Durango Pursuit V-8 can tow 7,200 pounds and offers standard trailer sway control. 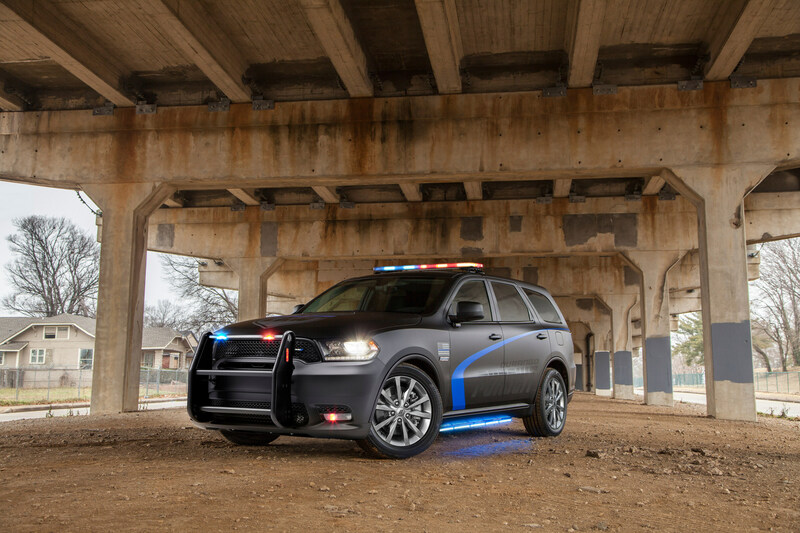 The 2019 Dodge Durango Pursuit was debuted at the 2018 National Sheriffs’ Association Show, which is taking place June 15-19 in New Orleans. It is expected to be available for orders later this summer.